You can only activate this card when your opponent declares an attack. Destroy 1 monster with the highest ATK among your opponent's Attack Position monsters. Interesting card here. VERY comparable to Sakuretsu Armor...yet slightly inferior. It's already considered nearly unplayable because you have to wait for your opponent to declare an attack...heck, the only thing we use right now that isn't somehow chainable to M/T removal is Mirror Force. Sakuretsu is better simply because you get to choose which monster dies...because you're activating the trap when you want to activate it. If your opponent has a Gemini Elf and Don Zaloog out, and you want to keep the card in hand, you can Sakuretsu the Don and take the 1900 from Gemini. This card really shouldn't see play in your Deck, unless you're making a no-monster Deck or an all Trap deck. In those cases, 1/1 tradeoffs are quite appealing (1 card of yours to get rid of one of theirs) but otherwise, stick with Wabokus, Call of the Haunted, Mirror Force, Imperial Order, and Ring...there's not much else that really NEEDS played right now. Omega Widespread Ruin is a fairly interesting card. Many compare this card to Sakuretsu Armor, and in a way it is similar, but in others it is better. You see Sakuretsu Armor destroys the monster attacking you, while Widespread Ruin destroyed a monster with the highest attack. Now usually the order of attacks is the strongest monster would be attacking last because you want to be doing the most damage. So by using Widespread Ruin over Sakuretsu Armor would be more beneficial. In the situation where there is only 1 monster on the field anyway the result would be the same. The best part of this card is that you’re not limited to destroying JUST attacking monsters. Say you’re opponent has a monster in defense and it happens to be the strongest on the field, Widespread Ruin would be useful here. Now this isn’t necessarily a weaker version of Mirror Force, but if you don’t have Mirror Force I suggest you try out Wide Spread Ruin, as it can be very helpful in the right situation. Even if you do have Mirror Force in your deck, try out this card. This is a fun card, not broken, not terribly weak, I’m giving it a solid 3/5. This is a nice little card (certainly better than the other things we’ve been reviewing this week) that may find its way into a few decks. Some things that jump immediately to mind are that 1) It’s a trap, and 2) It’s non-chainable. Barring those drawbacks, it has a fairly nice effect. It’s basically Sakuretsu Armor, but a little different…in some situations better, in some situations worse. More often than not you’ll save this for when the strongest (or only) monster is attacking anyway, in which case it’s a mini-Mirror Force. Not recommended for all decks (most people just don’t have room; Mirror Force itself in addition to Torrential Tribute do the job better), but if you’re on a budget or want to make a very annoying stall deck, go for it (or Sakuretsu; it’s a matter of personal preference). Effect(s): When your opponent attacks, you can activate this card to destroy their strongest monster. Note that this doesn’t negate the attack or anything, unless the strongest monster is attacking. So when Don Zaloog attacks, you can activate this… and hit a Spear Dragon that already attacked and has since shifted to DEF position. =/ Note that you must activate in response to an attack, so any Spell/Trap removal used on this will destroy it without a care. Uses/Combinations: Rush Recklessly to try and make sure the right monster gets destroyed-chain it to Widespread Ruin to make sure you nuke that stupid Don Zaloog instead of much less problematic Slate Warrior. Of course, a GAF in DEF mode still ruins this. Casual: 2/5-Maybe in an all Trap deck (or no monster). Tournament: 1.5/5-All Trap decks (or just no Monster) have never worked in my opinion. Limited: N/A-If you do somehow convince people to draft or whatever from promos, then it is a good pull here: outside of starter deck based events, it’s hard to pull a lot of Spell/Trap removal. 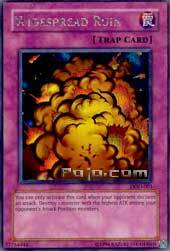 Therefore this should work as a safeguard against any one good monster your opponent gets on the field. If Waboku and Mirror Force aren’t enough, then add Torrential Tribute and/or Magic Cylinder. If those still aren’t enough, or you can’t get them, try Sakuretsu Armor. Only after all of that should you consider running this. Good concept, but it proves impractical: one-for-one deals only work when they are flexible and/or controllable. Heck, this seems weaker than Raigeki Break to me: two-for-one that can chain to just about anything and nuke anything on the field is much better. Maybe if it negated the attack and destroyed the highest attack monster, it might be passable.